We are a small business at heart and know the challenges you face in communicating your brand. Our experience allows us to offer you solutions that maximize your often limited marketing budget with high value print products and services. From basic products like letterhead and business cards to more impactful messaging items like brochures and presentation folders, we have you covered. We can also assist with local marketing campaigns, including direct mail, from conception to completion. We enjoy nothing more than watching your business grow while helping you achieve your vision. We help you protect your brand. As the marketing team for your brand, you face shrinking marketing budgets and an increasingly distributed sales force for which you must provide marketing collateral. Management demands hard data for you to justify your marketing expenditures. With our online collateral management system, we give you the ability to ensure brand uniformity, centralize your purchasing, control your marketing product line, and realize a greater ROMI for your budget. Let us show you how we can become your valuable print service partner. We bring your print vision to life. You have a very specific vision of what you create for print and need a partner who can execute that vision. Whether you are an independent designer or an agency with many designers, we offer the knowledge and expertise to bring your designs to life. Our knowledge of paper stock, print techniques, and finishing options can help you offer truly unique products to your clients. With exacting standards, we deliver on time and on budget while exceeding your quality expectations. We provide you the comfort knowing your clients will be impressed by the printed materials you designed. We can be your valuable partner. As a print reseller, you face specific challenges. You have to offer your customers a wide variety of products with consistent quality while having no control over the printing process. You must find a print partner that can provide resale pricing that allows you reasonable margins on your sales. As your print partner, we can do all this and more. You can trust us to allow you to offer a wide range of quality products at profitable pricing. Whether you need someone to handle production of all of your orders. or you just need a partner to fill-in gaps in your production capabilities, we are here for you. Beginning 25 years ago with our president and a small offset press, our history is deeply rooted in offset lithography. In that time, we've gained the experience needed to be your offset printing experts. This experience, when combined with our investment in equipment and technology, allows us to offer you offset printing that enables your project to convey the ultimate in printed quality. Our Heideberg DI press with waterless ink technology allows us to create stunning prints while being environmentally responsible. Digital printing provides access to high quality, short run printed products that were once only available for purchase in bulk at reasonable prices. We employ the newest digital print production equipment to ensure your products are of the highest quality. Our compulsion for quality digital color and our investment in the latest color technologies enable you to be confident that your project will fulfill your expectations. 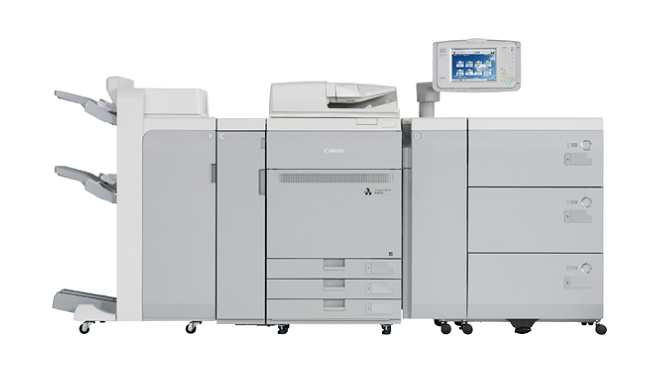 Our Canon imagePress c700 creates beautiful short-run color pieces, allowing us to offer a wide range of variable data solutions. We offer full print finishing services for our clients. If you know the perfect finishing for your project, we execute your vision with precision and skill. And if you have a vision but need help bringing it to life, we love to use our knowledge and experience to help you make your vision a reality. Whatever your finishing needs, we are here for you. Our bindery is full equipped to bring the vision of your printed piece to life. We promise to deliver high-quality products through a purchasing process that places the customer first, always treating the customer as the highest priority. We stand behind our products and promise that we will deliver an amazing product and experience. We are a small, growing business deeply rooted in the community. We the believe the client experience is the first priority. Our staff has an average of 18 years each in the print industry and an average of over 7 years each at Starling. Our knowledge and experience allow us to ensure your project exceeds your expectations.